Constructed from NylatronÂ® high-impact polymer with slightly crowned tread profile, Commander HD is machined rather than injection molded for impact strength. WheelÂ resists moisture and most chemicals while protecting floors. Offering capacities from 2,000–7,200 lb, Commander HD is suited for die carts, engine hoists, and ground support equipment. Wheel is available in 4, 5, 6, and 8 in. diameters, each with 2 in. tread width. Models with 3 in. tread width are availableÂ for 8 and 10 in. sizes. Jonesboro, Arkansas, – Colson Caster Corporation, the world’s leading manufacturer of standard and custom application caster and wheel products, has announced its newest line of heavy duty wheels for mass distribution: the Commander HD. The innovative wheel is designed for superior performance in some of the most abusive applications and environments where high-load requirements and impact resistance are a must. The new Commander HD wheel is available now in 4”, 5” 6” and 8” diameters, each with a 2” tread width. The wheel is also available with a 3” tread width for 8” and 10” sizes. 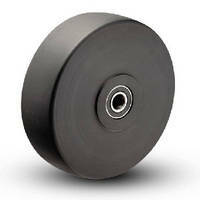 Capacities for each wheel range from an impressive 2,000 lbs to 7,200 lbs each. For more information on the Commander HD wheel, call 1-800-643-5515, email info1@colsoncaster.com or visit www.colsoncaster.com. For more than 125 years, Colson Caster Corporation has been providing the world with the highest quality and largest selection of premier caster and wheel products. Headquartered in Jonesboro, Arkansas for over 50 years, and with more than 150,000 square feet of state-of-the-art manufacturing space, Colson is a leader in caster innovation and builds exclusive caster products for all of the world’s markets. The company is the namesake brand for Colson Group USA, which is the world’s largest caster conglomerate. For more information, visit www.colsoncaster.com.